The Human IgG Lambda MAb kit is designed for the fast quantification of human IgGs Lambda light chains. Drug discovery and bioprocess often require accurate quantification technologies to improve the productivity workflow. Current methods such as ELISA do not properly fit with such objectives as they require multiple sample-handling and protocol steps. The human IgG Lambda MAb kit enables a rapid quantification of human IgG Lambda light chains in cell supernatant. The assay is compatible with natural IgG as well as recombinant antibodies. The human IgG Lambda MAb kit is detected in a sandwich assay format using 2 different specific antibodies. The anti-(h)-IgG Lambda antibody is labelled with d2 (acceptor) and the anti(h)-Fc antibody is labelled with Eu3+-Cryptate (donor). The two antibodies bind to the (h)IgG Kappa present in the sample, thereby generating FRET. The specific signal modulates positively in proportion to (h)IgG Lambda. 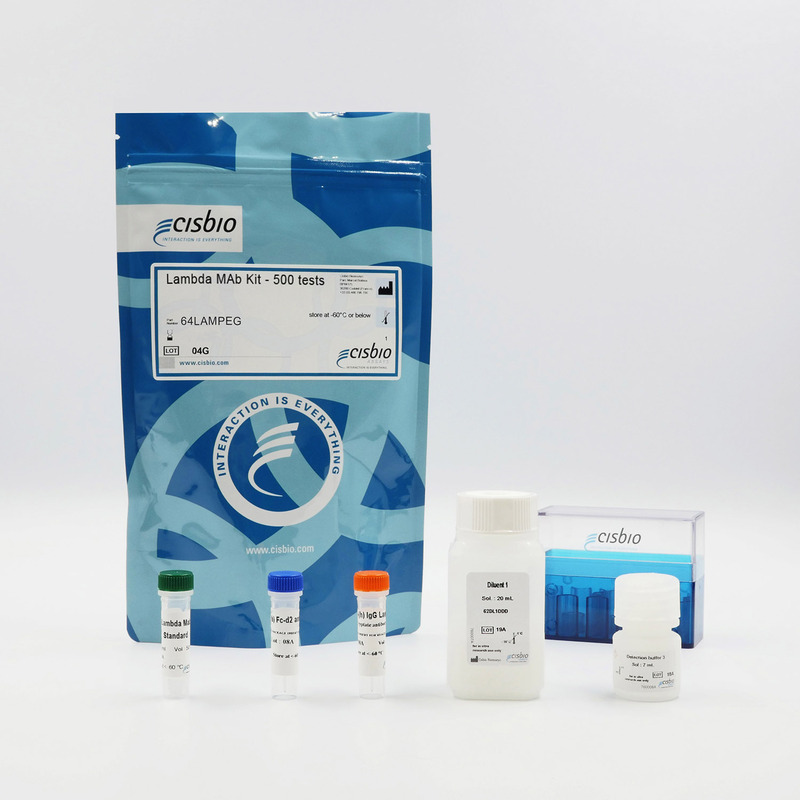 The human IgG Lambda MAb assay features a streamlined protocol with only 1 incubation step after sample and IgG lambda MAb detection reagents dispensing. This protocol requires a single two-hour incubation period at RT.